♥Location Tracker The watch can track and locate your kid’s position by GPS and LBS, even in buildings. For example, if in the park or back ground yard, the accuracy is up to 10m (33ft). If in the supermarket or in shopping mall, the accuracy is up to 100m(328). ♥SOS emergency call If in EMERGENCY, press SOS button for 3 seconds, the watch will dial the number you set in automatically. It would be a big help when the kid get lost in the crowd or something dangerous happened. ♥Voice Chat Not only phone call, you can also send text or voice messages to your child. It works like whatsapp normal SMS chatting tool, easy to use. ♥Health Assistant The watch records the basic activity data, such as pedometer, calories, distances, times of turnover in sleep. You can encourage the kid to do more exercise if the data is far away from expectation. Historical comparison will help you to find something unusual in the past 7 days. ♥Historical Route It will give us a clear memory of where and when that the kid has been We can choose the probable time period and we can find the places he had been. ♥Do not Disturb You can set three time periods to stop the watch receive or make calls. The kid could be more concentrate in the class and sleep more deeply at night. 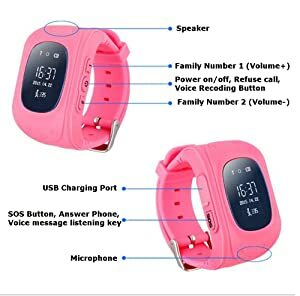 ♥Monitoring Function You can make the watch calls your mobile automatically with the help of monitoring function, and you can hear the voices from the child’s surroundings. Don’t be worried when your child is unavailable on phone. ♥Phone Book You can set 10 telephone numbers in app. All the calls the kid dials and receives are recorded already. No need to worry about harassment calls. ♥Anti-Lost and Remove Alert When the watch was removed by the kid or dropped on the ground, you could receive a message alert. If the watch is lost somewhere, the anti-lost function will make the watch ring for 1 minute and waiting to be found out. ♥Alarm Clock The watch can wake up kids every morning by setting the time in app. If your kid was lazy in the bed, set 3 clock alarms one after another by every 5 minutes, your kid would get up finally. 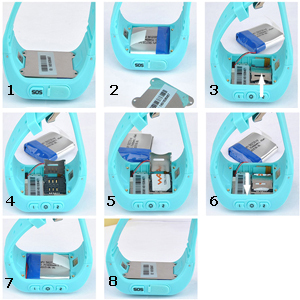 【More Functions】Two-way calls, SOS emergency call，GPS tracker, security fence，fitness tracker, phone book, make friends, pedometer, voice chat on App, watch remove alart, alarm clock, Red heart rewards, etc. 【SIM Card requirement】 The SIM card must support 2G network, with date traffic and can show caller ID. (Note: Some 4G SIM card can also support 2G internet. You can ask the SIM card provider if it can support 2G internet before buying)【SIM card recommend】 For US user, we would like to recommend: SpeedTalk. T-Mobile For Canada user, we would like to recommend: Microcell and Rogers. For Brazil user, we recommend: BCP,CTMR Cel,Maxitel MG,BSE ,Oi Velox ,CTBC 3G, Teleron ,Cel ,Telest Cel ,Telems Cel ,Telepar Cel ,Tess ,Claro ,oi ,TIM. 【About Registration】 1. Install the Setracker App. And then scan the QR code behind the watch to register an account. If you can't register it or it show "Device number already registered". Then please provide the IMEI number to us , we will help you register it successfully. 【About device offline】 Please take carefully to choose the correct area when you register the APP. For example, if you use it in US, then you need to choose the "North America" but not "Europe Africa" or the other area. Because if you choose the wrong area. Then it will show device offline when you operate the APP. 【Our services】 If you meet some problem in setting the watch.Please feel free to contact us, help you to solve the problem.